The Earl of Shaftesbury (1671-1713) was tutored by John Locke and wrote one of the most influential books of the 18th century, The Characteristicks of Men, Manners, and Opinion (1737). He included a number of illustrations designed by himself in order to complement the text. 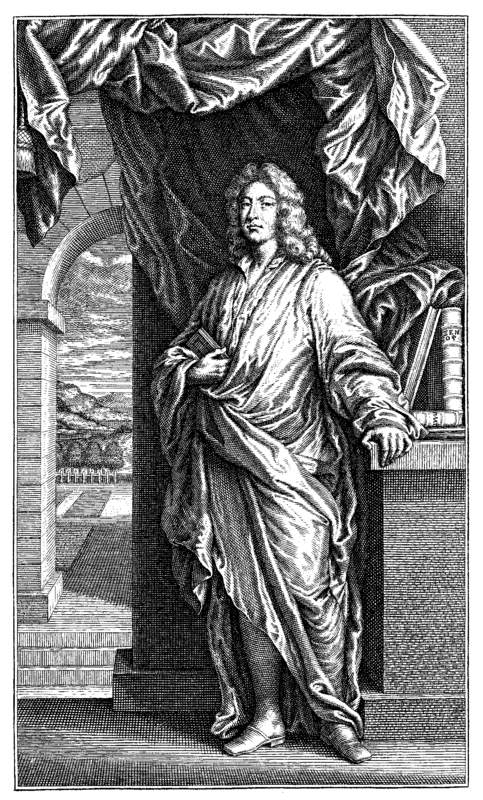 Shaftesbury designed the illustrations which accompanied the publication of his treatise in 1713. They are quite allegorical in nature and the meaning of many of the symbols is not entirely clear. A discussion of what they might mean can be found in Felix Paknadel, "Shaftesbury's Illustrations of Characteristics," Journal of the Warburg and Courtault Institutes, vol. 37 (1974), pp. 290-312. http://www.jstor.org/stable/750844. Shaftesbury also included "footnotes" in many of his illustrations, directing the viewer to relevant passages in his book which would explain or expand on the ideas presented in the image. We will provide links to these passages so our readers can explore Shaftesbury's ideas in further depth. We also provide links to much larger versions of the images. These are important as there is a great deal of finely drawn imagery which is only revealed in higher resolution images. 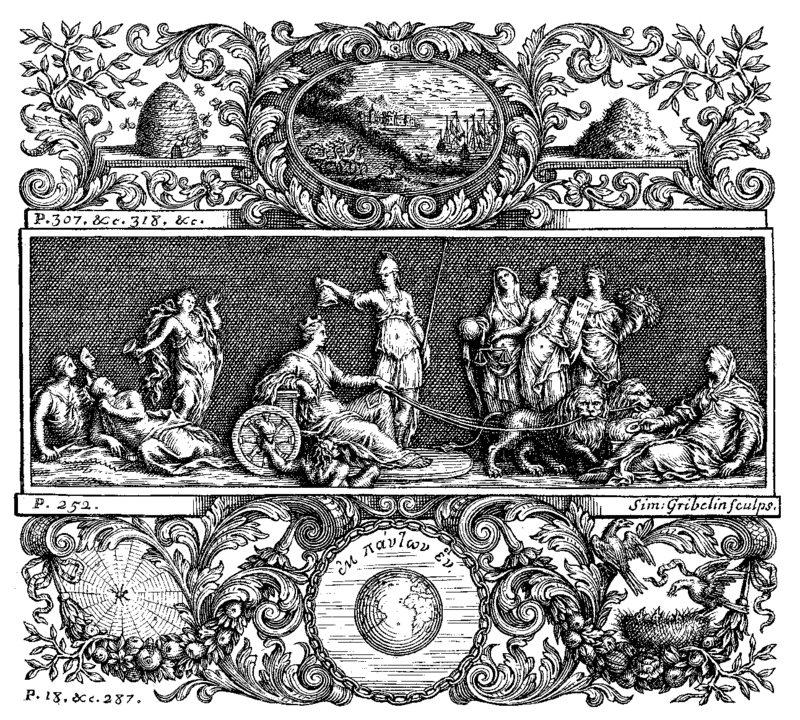 For example, in the title page to volume 2 a higher resolution image shows the herd of deer and flock of birds in the central part of the top panel; or in the portrayal of Shaftesbury immediately below one can even read the authors of the books next to his left arm - Plato and Xenophon. These illustrations comes from Liberty Fund's edition of Characteristics which was published with high quality cards of the art work to accompany the printed volumes. Anthony Ashley Cooper, Earl of Shaftesbury, Characteristicks of Men, Manners, Opinions, Times, ed. Douglas den Uyl (Indianapolis: Liberty Fund, 2001). 3 vols. /title/1851. Illustration of Shaftesbury; frontispiece to volume 1. Note the names of the books next to his left arm - Xenophon and Plato. One might conclude from this image that men are free to choose between vice and virtue, harmony and cooperation or disharmony and violence, whereas animals (such as bees, ants, birds, etc) cooperate with their kind naturally. Shaftesbury however is confident that when mankind is left free to choose then s/he will and does choose virtue over vice, with the result being cooperation, harmony, and prosperity. Note the "footnotes" Shaftesbury provides for each of the panels: top - p. 307 etc, p. 318 etc. ; middle - p. 252; bottom - p. 18 etc, 287. These passages give a clearer picture of the meaning Shaftesbury intended for this illustration.